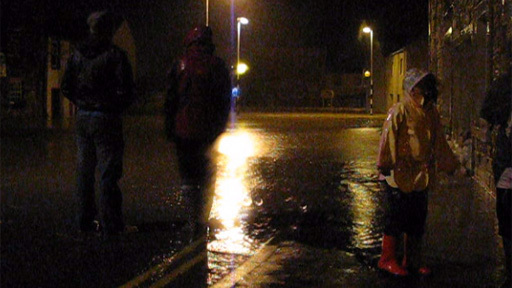 BBC News website readers have been writing to us to describe the floods that have engulfed their town. In Cockermouth, where water levels reached 2.5m (8ft 2in), more than 200 people were rescued by emergency services - 50 by RAF helicopters. 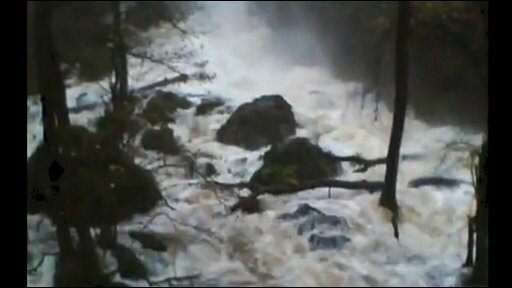 Flooding was also reported in Dumfries and Galloway in Scotland, where 30 roads closed in "treacherous" conditions. 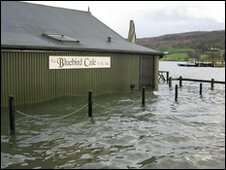 My wife and I run the Bluebird Cafe by the Coniston Water in the Lake District. We have been hit by the floods yesterday and last night. The water was coming in faster than we could cope with. We have approx 2 ft of water in the cafe. We have been running the cafe for the past 27 years and have never known conditions as bad as this. I'm totally devastated by all the damage. We are just 20m from water's edge normally. This morning we waded through waist height water to get to café. There is ten of thousands of pounds worth of damage. The cafe is a historical building and part of the Coniston boating centre. I live in the village of Patcastle, just outside Cockermouth, but couldn't get to work this morning so I'm no helping out with the rescue effort in the town. I'm at one of the two Cockermouth access points for rescue teams where life boats are being launched. The access points are where the flood waters are at their shallowest points, so it's safer to launch the lifeboats. I'm amongst St John's Ambulance workers, coastguard, RNLI and police who are working together in the rescue effort. I'm helping out at a soup kitchen that has been set up to help rescue workers and those who have been rescued. We've had donations of food from the local Sainsbury's supermarket. I've also been asked to help move people who have been rescued on the dry road route. I live in Cockermouth, on the main street in a flat above the shops. Me and my mum had to be rescued this morning by boat. We're now staying with my cousins. I am the manager of the Lodore Falls hotel in Borrowdale Valley where 70 guests and 60 staff are stranded. The guests are coping well but some are upset because they miss their children and want to go home. Some of our corporate guests are a bit frustrated because they were unable to attend business meetings and are trying to work with their laptops. 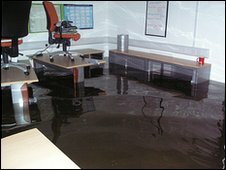 The lower floor is flooded as are some areas of the ground floor. I'm trapped in my office on the main street of Cockermouth. Luckily I have a bedsit on the third floor. I've been in contact with mountain rescue but I'm not a priority because I'm fit and healthy. The power went off overnight which was quite scary, but it's back on again now and it's daylight so it's not so bad. I can see rescue boats going up and down the street. At one point the water was up to 6ft but it has dropped a bit. I would say 95% of the businesses on the high street are small family run businesses so they will be devastated. I had an appointment in Kendal, but got as far as Ambleside and was stopped by the police and told I couldn't go any further because the roads were blocked. Even then the water was rising behind me. I ended up having to stay in a hotel in Ambleside overnight. A lorry managed to get through the water and made it into the hotel this morning, but the driver said that even 4x4s would struggle to through. The roads were full of debris and logs so even if the water does subside the roads will be horrendous. I'm Cockermouth born and bred. I spent 30 years in the Cumbrian police force and worked with Bill Barker a few years ago. He was a sensitive officer, a gentleman, dedicated to his job. There is sadness in the town that someone has lost their life, but the community is a strong one and we will pull together. I'm worried about how the town will get back on its feet as many of the businesses in the town are independent and the local factory that employs many people from the town has also been flood damaged. There are three of us marooned in an upstairs flat in Market Place, Cockermouth. Never seen it this bad. Two other people nearby in similar position, safe but stuck. Water is three to four feet deep. 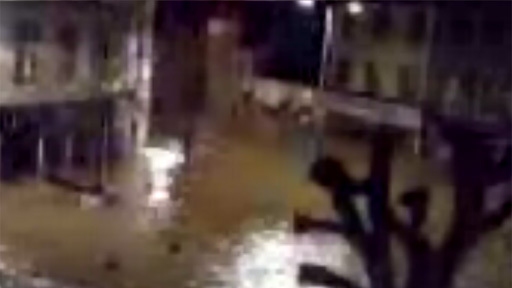 The rescue helicopter is busy nearby, we are in a narrow courtyard, so can't see a lot. My step dad is trapped in the upstairs of his house on Waterloo Street, Cockermouth. He is disabled and has three dogs with him. He has no food, no electricity or heating and no medication. The water is halfway up the stairs and rising. The next door neighbours (perfectly able-bodied) were rescued but he has not been contacted except by a paramedic to "asses his health". My mum was at work and is now at a friend's house - she is beside herself. They were flooded in 2005 and Mum says she can't go through the aftermath of that again. I am trapped upstairs in my house with my two daughters (18 and 15) and my daughter's boyfriend. This is the third time in four years we've been flooded so we knew what to expect, although it's never been as bad as this. Our entire downstairs is flooded - it's up to chest height. And we're thinking it's only going to get worse because it has not stopped raining. We have no electricity, no hot water, no heating so we're sat up here in the dark. We've got a camping stove which we'll use for dinner tonight but we'll have to try and get some more food for tomorrow. My parents are 73 and live just down the road, but I can't get to them now. They're starting to get worried so I called the police to see if they could help. Just been down to see Cockermouth town centre. Devastation. Worse I've seen since I've been here, which is 20 years. All we've had for 36 hours is wind rain rain rain. No trains south. We tried driving out of the village this morning for the school run - both roads out were flooded with foot deep lakes and in a small hatchback I didn't dare risk it. My neighbour did make a dash for it - in a 4x4 with an anxious teenager on board, destined for an exam at Cockermouth School. Hope she made it. Since then, the only traffic in and out has been milk tankers and tractors. All a bit grim. Although we live in a house on high ground, the road through the village is a streaming river, fields are underwater and high winds are bringing tree branches down. Lots of local schools are closed or closing and folk are coming home from work early in case they can't make it later. Light now fading and everything getting very bleak - hope we don't lose power lines or the phone. Scary. I have just spoken to my friend who lives in Cockermouth and she is stood thigh high in cold, dirty water in her living room. When I spoke to her, there was no sign of any emergency help and it is going to get worse because it is still raining and even when it stops, the water will still be flowing down from the fells. This happened at the same time last year but this time it is much, much worse. How much longer before the government will take real action against this instead of talking about it? Flood damage is devastating and many people in Cockermouth can no longer afford the high insurance premiums or excesses imposed so they are left with no means to replace or repair. The rain isn't letting up, and flood waters are rising at an alarming rate. Four of the six bridges in Cockermouth weren't passable at 4pm, and it's getting worse now. People's homes and businesses are at risk. Dreadful. 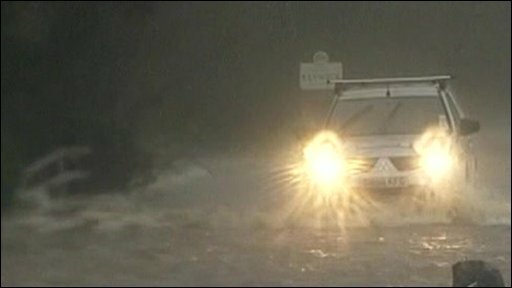 The rain is truly relentless, I go to school in Cockermouth and have sat my First two GCSE exams before having to go home out of fear of not being able to get to the village in which I live, the road was flooded in many places and the bus had to take a different route than normal. I highly recommend that if you are coming to Cumbria this weekend that you bring a boat. This isn't funny anymore..... not that it ever was. 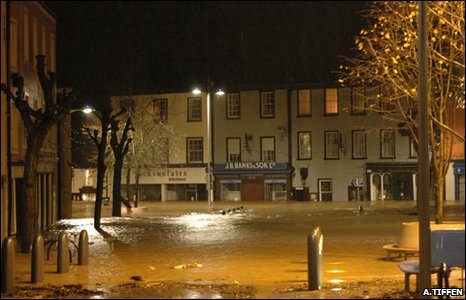 If Carlisle was so badly flooded a few years ago, why didn't we get the same treatment? It's the same river and we're more in a valley. Mother Nature's had her fun... it's time to stop. Are you in one of the areas hit by flooding? What are conditions like? Send us your comments and pictures.